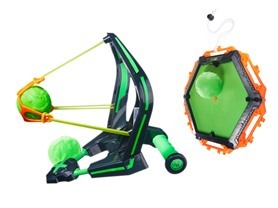 Check out this Diggin Slimeball Slinger and Target Pack $19.99 (Retail $39.99). Ready, aim, fire! Shoot slimeballs up to 30 feet with the Slimeball Slinger! Pull back the Slinger and let the slimeball fly! Launch your slimeball at the super sticky target. The slimeball will stick to the target but won't stick to anything else nor leave any marks. -Pull back the Slinger and let the slimeball fly up to 30 feet! -Active slime fun without the mess!